Civil Motions: Thursdays at 10:00 a.m.
Criminal Motions: Thursdays at 2:00 p.m.
Motions: Motion dates may not be reserved, and it is not necessary to clear a date with the courtroom deputy ("CRD") before filing a motion. All Thursdays on the motion calendar are OPEN unless the date appears on the “Closed Motion Dates” portion of the motion calendar. Unless otherwise ordered, counsel shall notice the motion no earlier than 28 days from the filing date of the motion. (See Local Rule 6-1). Any motion that is noticed more than 35 days beyond the date the date the motion is filed shall be stricken or advanced to an earlier motion date. A motion may be noticed more than 35 days beyond the date the motion is filed if the selected motion date is closed. However, the motion must be noticed for the first open motion date on the court's calendar. If the motion is advanced to an earlier motion date, counsel shall comply with the briefing schedule dictated by the new motion date. (See Local Rules 7-9 & 7-10). Discovery Motions and Proposed Protective Orders: Unless otherwise ordered, all discovery motions and proposed protective orders are to be calendared and/or presented to the assigned Magistrate Judge. Ex Parte Applications: Ex parteapplications are solely for extraordinary relief and are rarely granted. Ex parte applications are taken under submission on the papers and are rarely set for hearing. If a hearing is necessary, the CRD will notify counsel of the date and time of the hearing. The moving party shall immediately serve the ex parte application on the opposing party by fax, e-mail or hand delivery and shall notify the opposing party that any opposition must be filed within 24 hours after the service of the application. The moving party shall advise the court in its application whether opposing counsel will be filing an opposition and describe what efforts, if any, have been made to confer with opposing counsel regarding the substance of the application and any potential resolution of the application. A copy of the ex parte application and any opposition must be delivered directly to the Clerk's Office drop box on the same day it is e-filed. All ex parte applications must include a proposed order. (See Local Rules 7-19 and 7-19.1). Telephonic Appearances: Telephonic appearances for hearings in court are not permitted. guarantee an interpreter on less than one day’s notice. Documents Filed with the Court: All filings shall conform to the requirements set forth in Local Rule 11. In addition, counsel shall e-file all criminal and civil documents pursuant to Fed. R. Civ. P. 5(d)(3) and Local Rule 5-4. Any party seeking to file any document under seal must comply with Local Rule 79-5. Filing Documents Under Seal: In civil cases, counsel shall comply with Local Rule 79-5.2. Also, counsel should review the "Guide to E-filing Sealed Documents 11.25.15," found on the court’s website. In criminal cases, counsel shall follow the instructions set forth in the attachment below (CR Under Seal Procedures). A document presented for filing at the Civil Intake or Criminal Intake Windows will be rejected, and the party submitting the document will be directed to follow 79-5.2, or Judge Olguin’s criminal sealed document procedure attached. Continuances: Counsel must submit any request for a continuance or extension of time no later than five court days prior to the expiration of the scheduled date. Requests for continuances will not be granted routinely. A stipulation to continue the date of any matter must be supported by a sufficient basis that demonstrates good cause as to why the change in the date is essential. The stipulation must also indicate whether there have been any previous requests for continuances and whether these requests were granted or denied by the court. Counsel requesting a continuance must electronically file a stipulation and lodge a proposed order that includes a detailed explanation of the grounds for the requested continuance. If it is necessary to file an ex parte application seeking an extension of any deadline, the application must be accompanied by a declaration setting forth the reasons for the requested extension of time. The declaration must also indicate whether there have been any previous requests for continuances and whether these requests were granted or denied by the court. Bail review: A party seeking review of a Magistrate Judge's bail decision on the basis of information or evidence that was not presented to the Magistrate Judge must seek reconsideration from the Magistrate Judge who originally issued the bail decision. In general, the court will not consider any information or evidence that was not presented to the Magistrate Judge. Scheduling, Case Management and Trial Procedures: Orders addressing all of these issues will be issued by the court. 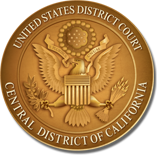 Courtroom Equipment: Counsel should contact the Help Desk at 213-894-3061 to arrange training on the Court’s Audio Visual Equipment. Communications with Chambers Staff: Counsel should not contact the court’s law clerks unless responding to an inquiry initiated by chambers. Status Inquiries: The CRD will not return calls regarding the status of submitted motions, stipulations or proposed orders. Counsel may determine the status of any submitted motion, stipulation or proposed order by accessing the docket sheet through PACER. Law Clerk/Extern Applicants: Applications should be sent to Judge Fernando M. Olguin, 350 West 1st Street, Suite 4311, Los Angeles, CA, 90012-4565. Applications should include: (a) a cover letter; (b) resume; (c) two writing samples; (d) two letters of recommendation; and (e) if out of law school less than three years, a law school transcript. Applicants should indicate on the outside of their envelope whether they are applying for a clerkship or an externship position. ​A mandatory chambers copy of all e-filed documents shall be delivered to the Clerk's Office, 4th Floor, no later than noon the following business day. All mandatory chambers copies shall fully comply with the document formatting requirements of Local Rule 11, including the “backing” requirements of Local Rule 11-4.1.1. Each document must be labeled prominently, “Mandatory Chambers Copy,” on the front page and the notice of electronic filing shall be attached to the back of the document. Do not bind or staple separate filings together as one document. Preferred method of communication is email. Do not contact the clerk for updates of proposed orders, motions, etc. For additional information, please see: madamreporter.com For general information on how to order a transcript of any reported or digitally recorded proceeding, please contact 213-894-3015 or visit the court website (www.cacd.uscourts.gov) section referring to Court Reporter/Recorder Transcripts. If you require an estimate of cost for the preparation of a transcript, contact the court reporter/recorder for the desired proceeding. To determine the court reporter/recorder for a particular proceeding, go to the Court Reporter Schedule web page and click on “by Date.” Once you have determined the correct court reporter/recorder for the desired session, click on Court Reporter Phone and E-mail List for contact information.